Hi again from Adam in Norway’s Finse station. Today we had a “bad” weather day – some clouds rolled in, obscuring the view of the Hardangerjokull ice cap and it’s been generally chillier. However, considering that I’ve previously conducted Arctic fieldwork in blizzards and whiteouts, we can hardly consider a bit of cloud as “bad” (hence the inverted commas!) and we’re still really lucky with the weather. And to be honest, a low-hanging cloud looming above you does give the fieldwork a bit of Middle-Earth dramatics…! Benny and the radar ‘snake’ head north, under a cloudy Midtdalsbreen glacier. Thanks to the great weather, data have been rolling in and I thought I’d share an initial image. The data you can see here can be considered as a cross-section through the glacier. Obviously, the section I’m showing here is hot-off-the-press and requires much more processing, but we can already spot the change in the ice conditions! You’ll remember that we’re looking for the tell-tale signs of ice frozen to its bed and, in my first blog, I gave an impression of the sort of things we’re looking for in our radar data; ‘fuzzy’ patches of the glacier are a strong indicator of unfrozen water within the ice, whereas the ‘transparent’ sections suggest that the glacier is completely frozen. This particular section is a GPR profile from the upper reaches of Midtdalsbreen, down to its margin and onto its foreland. An example GPR profile from Midtdalsbreen. Even at this early stage of the work, we see clear responses from the glacier bed, the englacial water, and the entirely-frozen zone at the margin. We see the glacier bed very strongly in this image; whilst it appears to slope upwards, we must remember that surface topography slopes downwards, so the glacier bed is probably not as steep as it appears here. However, the ice thickness will still be pretty accurate, and you can see that Midtdlasbreen has a maximum thickness exceeding 65 m thick along this particular line. There are plenty of sections of this dataset which show the ‘fuzzy’ responses of liquid water; however, you’ll notice that there is a transparent layer which undulates across the length of the profile and – critically for Benny’s hypotheses – is also present at the very edge of the glacier, right down to its bed. These images are very promising indeed, and we’ll be adding detail to them during further acquisitions and in later data processing. This particular dataset took about 15 minutes to acquire, and is around 1 km long. Efficient acquisition! Sadly, Benny leaves tonight as he is off to the EGU conference in Vienna. He’s presenting a poster on his day-job research, in which he interprets signatures of ancient ice-sheets in seismic datasets from the North Sea. I’m sad to see him go, but he’s left me with a good few areas of the glacier to survey and I look forward to welcoming Dr Anna Hughes to Finse to replace him! Benny’s final duties were somewhat ‘janitorial’, dusting down the equipment boxes of the snow they’d accumulated during the journey from Midtdalsbreen back to Finse Station. Benny’s last night… Brushing off icy boxes before bringing them indoors. See you soon! Anyway, I’ll get Anna to post a couple of words about her own research one evening. Until then, it’s bye from Finse! Hi again from Adam, blogging from Finse station! Happy to report that the sunny conditions which greeted us on Saturday have remained, and we’ve benefitted from amazing conditions for surveying. Great visibility, calm wind and no precipitation risk is a great recipe for a pleasant glaciological campaign! Yesterday was our first full day on Midtdlasbreen and Benny and I spent the day on the glacier margins, testing our ground-penetrating radar (GPR) system and setting up a few survey grids to target ice conditions beneath our feet. Grid set-up can be a bit of a guessing game: while Benny knows that he wants to work around the glacier margin, last time he saw it (August 2013), it wasn’t buried beneath several metres of snow. Add to this the fact that the glacier will have retreated a few metres since August, knowing that we’re exactly where we want to be can be problematic and his disorientation is entirely forgivable! Fortunately, we have the GPR. If Benny gives me a ball-park guess of where the glacier margin is, I can quickly use the radar to zero in on exactly where we should be working. This is one of the great things about GPR: its display is almost real-time, so you can quickly make an initial assessment of what is buried beneath you. Wires, ice and cold hands don’t mix! 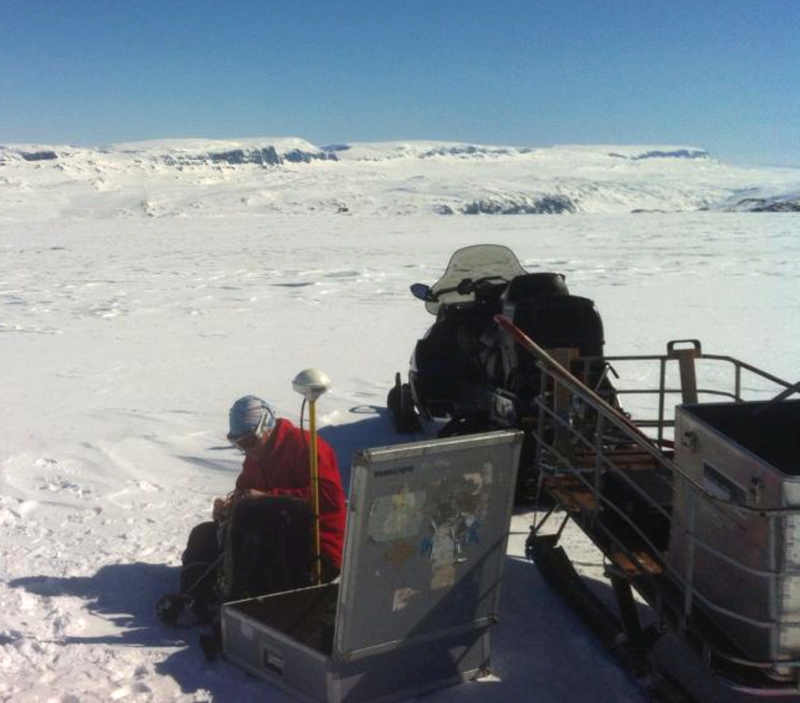 Setting up the GPR equipment on Midtdalsbreen. Surveying is pretty efficient – which is good, because walking under the weight of the equipment is a great way to keep warm! Our GPR system – made by Mala Geoscience – is robust enough just to be dragged along the floor behind us as we walk over the glacier. We simply connect it to a control console, secured in a rucksack, and tow it along. Informally, this system is called ‘The Snake‘ – the photo below, in which Benny is operating the system, should suggest why! The system triggers a recording every 0.5 seconds meaning that, at a typical walking pace over snow, we get a measurement of the glacier every 30 cm. 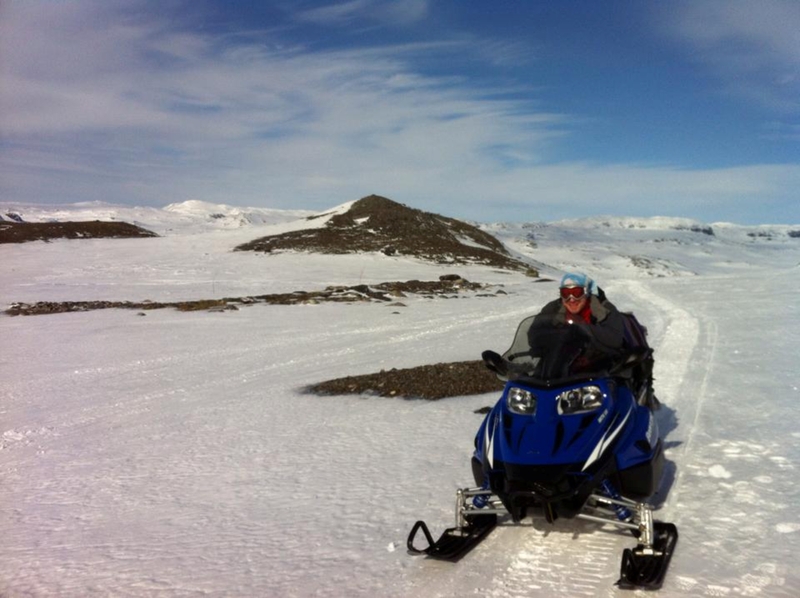 Benny tows ‘The Snake’ GPR system along Midtdalsbreen. 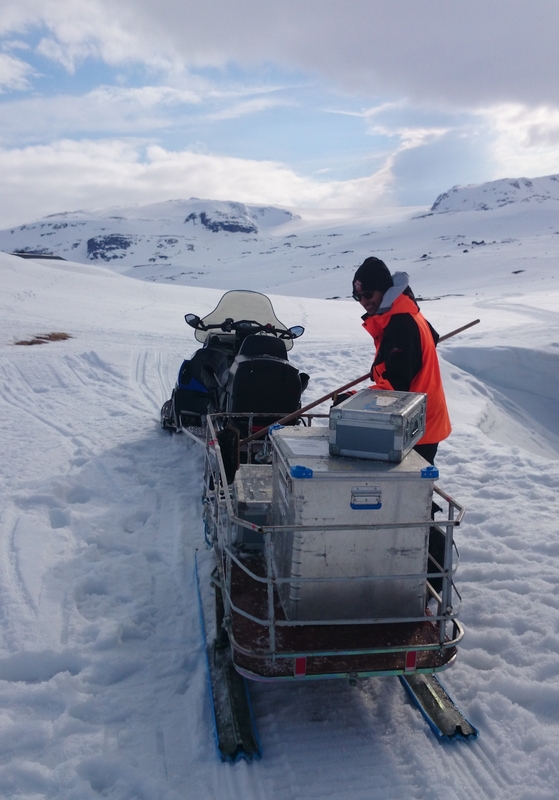 Where we have a particularly long line to survey, we can also attach The Snake to the back of our snowmobile. Compared to walking, this approach makes geophysical survey feel like a piece of cake…! In this video link, you can come for a snowmobile cruise along the top of Midtdalsbreen with me and Benny! However, we still have to survey quite slowly to get the detail we require, and snowmobile engines quickly overheat if they are driven at walking pace for too long. As such, the main mode of surveying is still pedestrian-powered. Still, it leaves the glacier nice and peaceful, for us and the ski-mountaineers who pass us by through the day. All in all, it’s been a great kick-off to the fieldwork and we think we’re starting to get some really great data. I’ll share some with you in the next few days; right now, it’s time to watch the snow turn pink in the sunset. A pretty sunset, as viewed from Finse research station. This afternoon, we arrived at Finse on the train from Bergen in glorious sunshine. 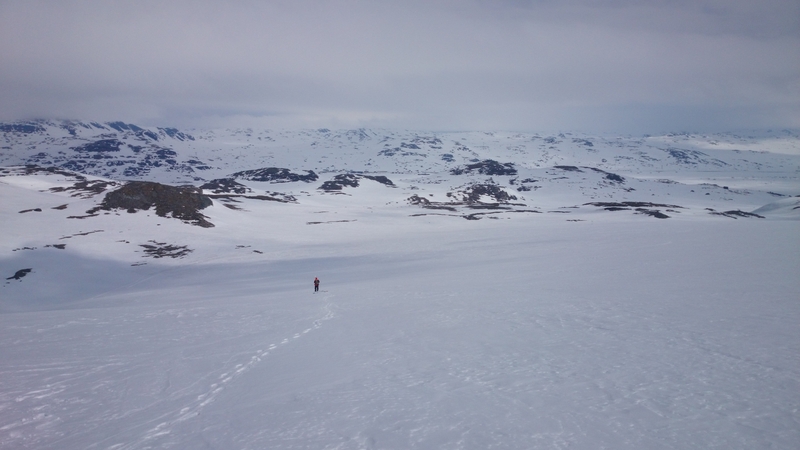 It is strange for me (Benny, that is) to come to Finse when there is snow and even in April there is still a great deal of snow – a couple of metres in most places. I am used to a landscape of large boulders, numerous lakes and peat bogs. 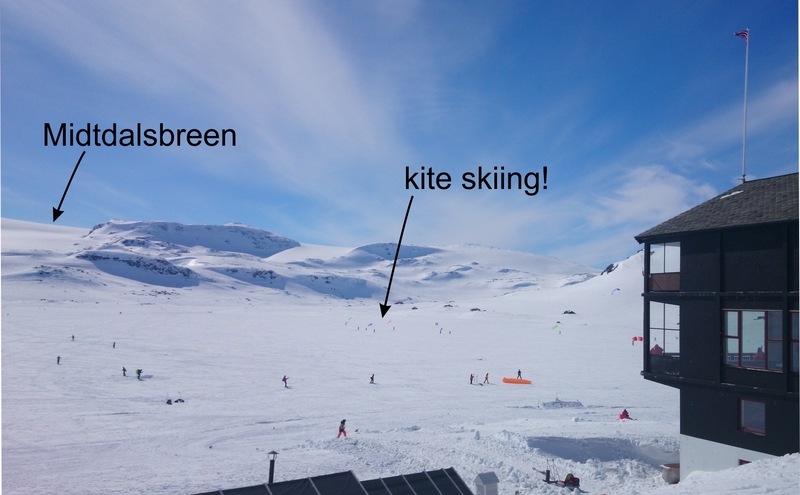 This is all now covered in thick snow – the large lake next to Finse is frozen with many people kite skiing across it. Our arrival at Finse, with a gloriously sunny view of Midtdlasbreen. And we’re not the only ones benefitting from the weather! It’s somewhere in there! 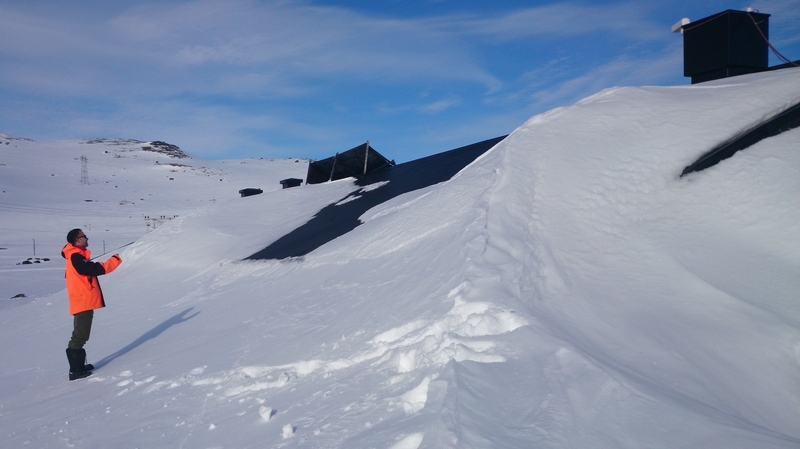 Benny identifies Finse Station under drifted snow. Midtdalsbreen fascinates me for several reasons. I always think that if you want to find out what a glacier did in the past a good start is to dig some holes in front of it and look at the sediments. Midtdalsbreen, like the neighbouring glaciers, has water at its bed. However, back in 2010 when I first came to Midtdalsbreen, the sediments within the moraines – ridges of earth in front of the glacier – suggested to me that a small part of the glacier was actually frozen to its bed. I then looked at descriptions of the moraines from the 1960s but found that these moraines no longer existed and had been totally eroded away over the last 60 years. The reason for this is probably because moraines and other landforms that are produced by a ‘frozen-bedded’ glacier are not preserved for very long. Why is this significant? Well, I would argue that it indicates that these frozen bed conditions were probably far more widespread in Norway and many other areas then we have previously thought – but the evidence of this in terms of landforms we can see is lacking. Thus digging holes and looking at glacial dirt is important, and Midtdalsbreen is important because it gives us a glimpse into how variable a glacier can be and how this is expressed in the landscape around us. Since the weather was so good we decided to head up to Midtdalsbreen this afternoon for a reccy. In summer this trip would normally take 80 minutes on foot, but takes under 1o minutes with the snow scooter – this gives you an idea of the terrain under the snow! Adam at the helm of the snow scooter, headed to Midtdalsbreen. Tomorrow we hope to get underway with our geophysical survey and I am sure Adam will have more to say about that in the next few days. Going Glacial! All set for Finse. Hello, Adam here, and thanks for checking out our field blog! Actually – ‘field blog’ is a little bit premature at the moment as I’m still sat in my flat in London…! But my flight to Norway is early tomorrow morning, and I thought I’d just take the opportunity to outline the INTERACT-funded work we’re going to be doing at Finse Station over the next few weeks. 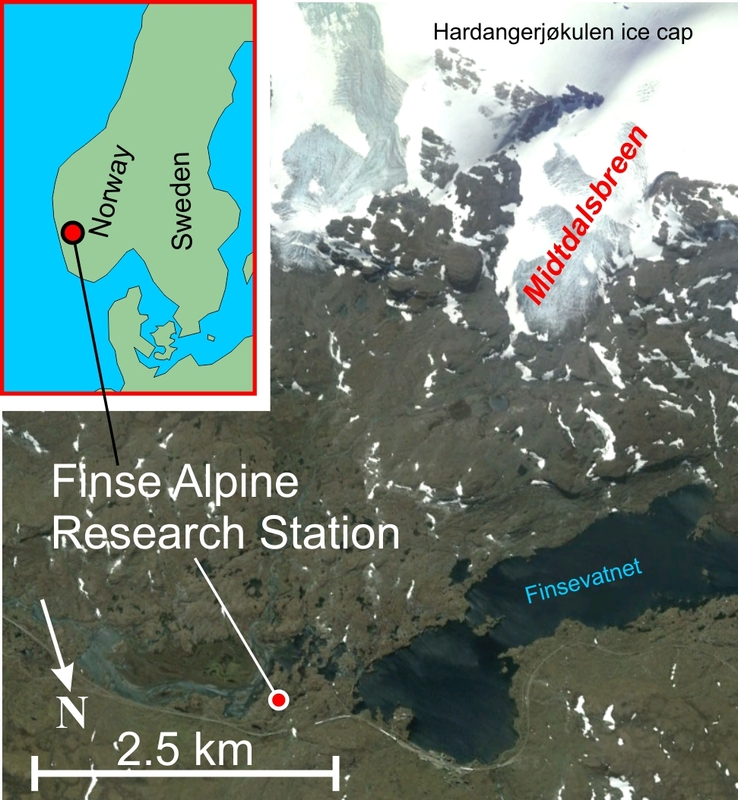 Finse Station is close to the glacier Midtdalsbreen (see the satellite photo below – thanks Google Earth!). Midtdalsbreen flows in a north-easterly direction from the Hardangerjokulen ice cap, and we’ll be working on Midtdalsbreen while based at Finse. Location of Finse and Midtdalsbreen in Norway. What is so interesting about Midtdalsbreen? I suppose that this is really a question for my colleague, Benny Reinardy, to answer – however, I will try to give you as good an overview as I can! Benny is a glacial sedimentologist, and his trained eye has spotted something interesting in the landforms immediately in front of Midtdlasbreen. These landforms are created as a glacier scrapes over the ground surface and, to a sedimentologist like Benny, they can serve as a record of what that glacier was like. Benny believes that the landforms infront of Midtdalsbreen were created by a glacier that was frozen to its bed; however, the majority of Midtdalsbreen is unfrozen at its bed so, if Benny is right, the edges of the glacier must have a different thermal regime to the rest of it. Our work at Finse is therefore to establish whether the marginal ice at Midtdalsbreen has liquid water at depth. At some point during the fieldwork, I will ask Benny to contribute a blog to this page and he can give more detail. However, when it comes to detecting liquid water within a glacier, I’m personally on more familiar territory! 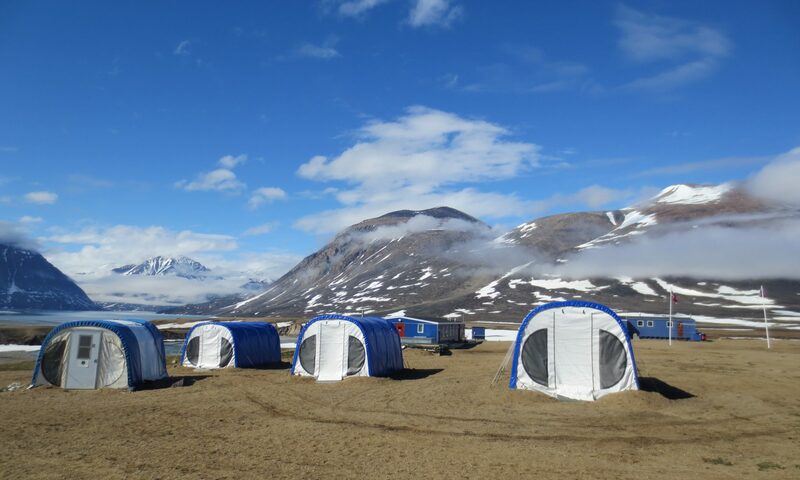 I’m a geophysicist, and I specialise in the use of seismic and ground-penetrating radar (GPR) methods for characterising a target subsurface; and it’s GPR which we are using at Midtdalsbreen. 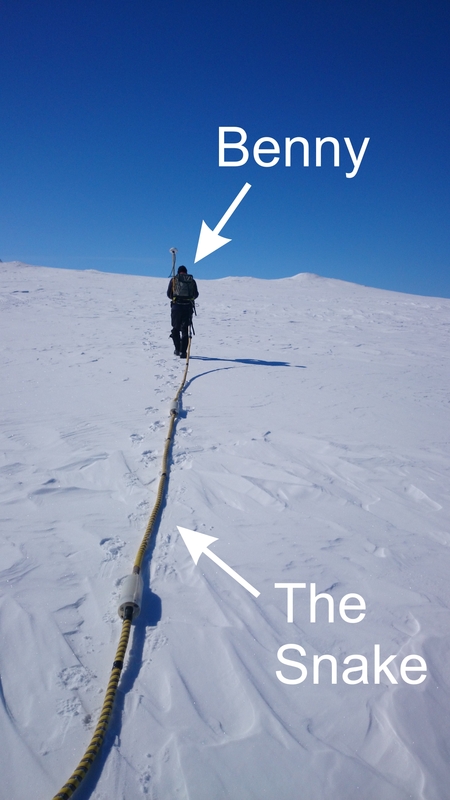 You can think of GPR as being like an x-ray for the ice; a transmitting antenna sends a pulse of radio wave energy into the glacier and, when that energy encounters some interface, it is reflected back to the ice surface and recorded at a receiving antenna. That interface could be the glacier bed, rocky debris within the ice, or it could be pockets of englacial water. The image below shows inclusions of englacial water within a glacier on Svalbard (at a depth of about 50-90 m beneath the glacier surface), in the high Norwegian Arctic. Compared to the glacier bed, which gives a sharp radar response, englacial water is associated with a ‘fuzzy’ signal – if we see no such responses around the edges of Midtdalsbreen, this might indicate that the glacier is indeed frozen at its bed. GPR data from a glacier in Svalbard. Englacial water is interpreted from the ‘fuzzy region’ of GPR responses. So – that’s the big idea! 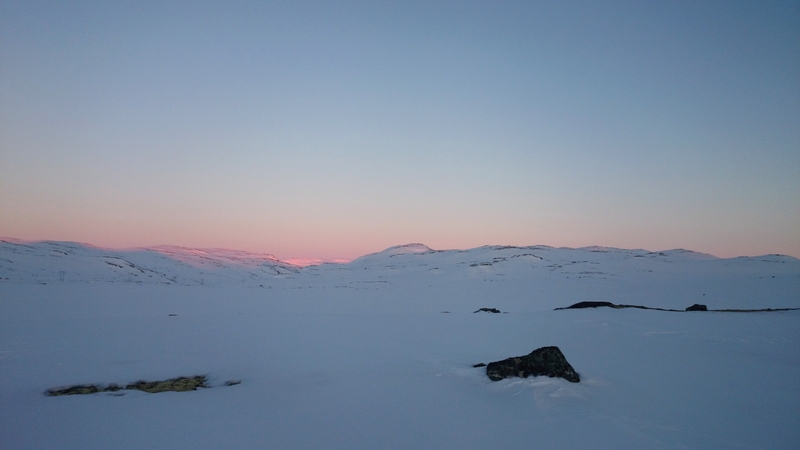 We’ll give you some updates from Finse itself and let you know how we’re getting on. I should also add that, while the Google Earth image suggests that Finse might be quite a green place, the image below is a shot the Finse webcam a couple of days ago. However, the more snow, the better as far as I’m concerned – I did too many surveys last year in hot places, and it’s time to chill out again! 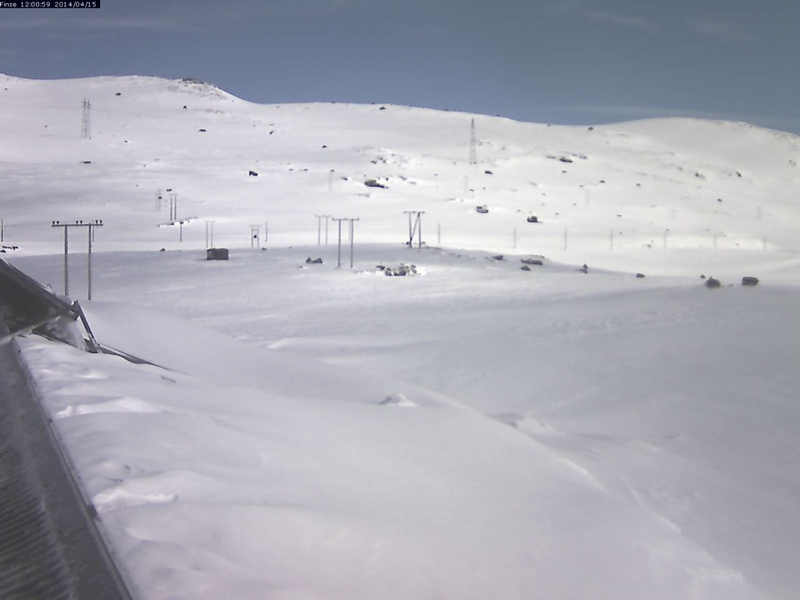 A still from the Finse webcam, taken on 15th April 2014. Brrrr! Thanks for visiting – speak to you soon!